Pinebrook Farms in Asheville, North Carolina, enjoys a rural setting in one of the country's more talked-about areas. Main level living and low-maintenance homes, a spacious community center and beautiful walking trails are just a few of the features found in this lovely development. 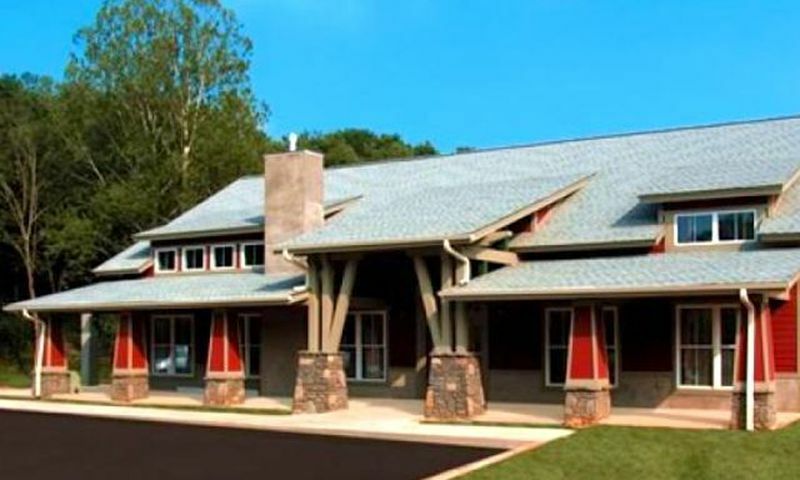 Pinebrook Farms community clubhouse is an ideal gathering place for residents. The multi-purpose community room includes a cozy fireside seating area, a flat-screen TV, billiards, tables and a catering kitchen. This versatile room can easily be used for club meetings, card games or community events. A small exercise room offers treadmills and a universal weight machine. Outdoors, the heated swimming pool can be enjoyed when the weather is nice. The surrounding area includes chaise lounges for those who want to relax poolside or soak up some summer sun. Throughout the grounds, walking trails allow residents to take in the community s natural beauty. Creekside Trail winds along the Reems Creek, which is one of the area s most well-known trout streams. Residents can also make use of the outdoor pavilion, complete with a built-in grill. Residences at Pinebrook Farms are available in over a dozen different floor plans. In all, there will be 127 residences in Pinebrook Farms which includes single-family homes, townhomes and carriage duplex homes. Home sizes range from 1,248 to 2,983 square feet and are designed in a distinct Arts and Crafts style. With such a wide variety of choices, potential residents can easily find homes to meet their needs or customize their own floor plan. Single-family homes at Pinebrook Farms include both single-level and two-story floor plans. However, designs focus on main-level living, with bonus rooms or flex space available upstairs. They typically include 1,536 to 2,424 square feet with two to four bedrooms, at least two bathrooms, and an attached garage. Single-family homes are available on a new and resale basis. Creekside Townhomes are offered in three floor plans that are between 2,220 and 2,983 square feet in size. Homebuyers can select a new or resale townhome that has three to four bedrooms, three bathrooms, and attached two-car garage. Carriage Homes are attached residences that can be found as both new and resale. These models have between 1,392 and 2,586 square feet of living space with two to three bedrooms, two to three bathrooms, and an attached garage. Pinebrook Farms is a picturesque setting which combines the charm of country living with the convenience of nearby shopping, dining and recreational attractions. Residents often choose Pinebrook Farms for its ambiance, which is reminiscent of an earlier, more simple time. Designed in a distinctive Arts and Crafts style, homes throughout the community have a casual look which blends seamlessly with the area s natural beauty. Visiting with neighbors is a traditional part of country living, and Pinebrook Farms offers several opportunities for residents to socialize. The clubhouse provides plenty of gathering space, as well as amenities such as billiards and tables that can be used for card games or club meetings. Asheville is a beautiful, eclectic area which is quickly becoming one of America's most popular destinations. Those who vacation in Asheville often end up relocating to the area. The magnificent mountain views, quaint shops, outdoor recreations, art and music festivals, and wonderful dining encourage visitors to relocate, and make residents feel like they are permanently on vacation. Located in North Asheville, Pinebrook Farms enjoys a country setting while still being surrounded by nearby grocery stores, restaurants, banks and other general services. A few miles away, the charming town of Weaverville boasts a classic Main Street with antique stores, boutique shops and unique restaurants. Pinebrook Farms is also within minutes of downtown Asheville. This exciting area offers a variety of cultural and recreational attractions, including galleries, performing arts centers, bookstores and much more. Pinebrook Farms is a wonderful community for homebuyers looking in Western North Carolina. There are plenty of activities available in Pinebrook Farms. Here is a sample of some of the clubs, activities and classes offered here. Carriage Homes are attached residences that can be found as both new and resale. These models have between 1,392 and 2,586 square feet of living space with two to three bedrooms, two to three bathrooms, and an attached garage. Creekside Townhomes are offered in three floor plans that are between 2,220 and 2,983 square feet in size. Homebuyers can select a new or resale townhome that has three to four bedrooms, three bathrooms, and attached two-car garage. Single-family homes in Pinebrook Farms come in many shapes and sizes. They typically include 1,536 to 2,424 square feet with two to four bedrooms, at least two bathrooms, and an attached garage. Single-family homes are available on a new and resale basis. We love how unique this community is. The homes are really well designed and have charming curb appeal. There are lots of different floor plans to choose from and the builder includes a lot of things you'd pay extra for somewhere else. It may cost a bit more but you get what you pay for. The builder is great to work with. The clubhouse is very nice and we enjoy spending time there. 55places.com is not affiliated with the developer(s) or homeowners association of Pinebrook Farms. The information you submit is distributed to a 55places.com Partner Agent, who is a licensed real estate agent. The information regarding Pinebrook Farms has not been verified or approved by the developer or homeowners association. Please verify all information prior to purchasing. 55places.com is not responsible for any errors regarding the information displayed on this website.